Bill Hader On Sketch Comedy, His Love Of Old Films Saturday Night Live's Bill Hader, nominated for an Emmy for his character Stefon, an obsessive clubgoer, says he needs a character to be funny. Hader tells Fresh Air that he doesn't know how people do standup — and that watching old films as a child sparked his interest in Hollywood. Bill Hader was nominated for an Emmy as Outstanding Supporting Actor in a Comedy Series for his role as Stefon on Saturday Night Live. 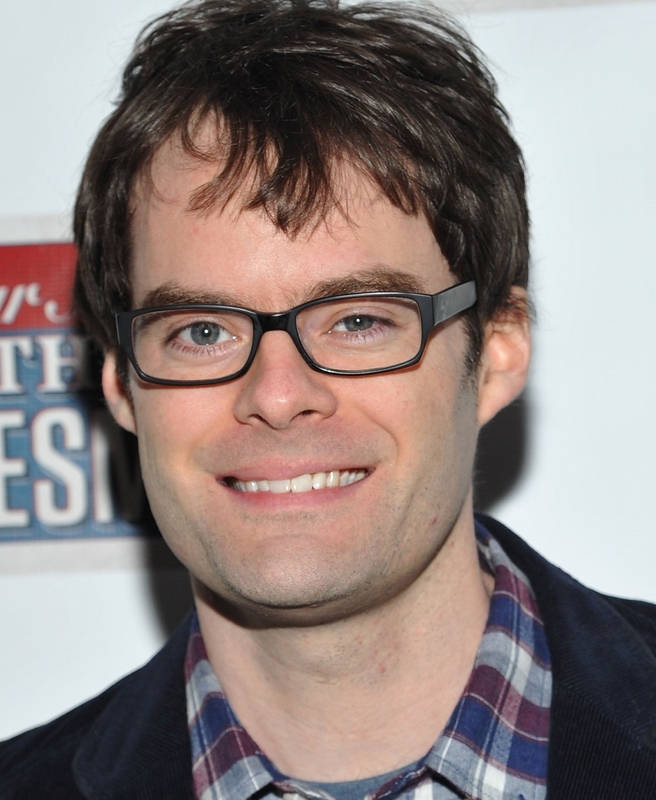 Comedian Bill Hader is adept onstage and doing live performances. But he's scared to death of standup. He says he remembers watching Chris Rock's 1996 HBO special, Bring the Pain, and thinking, "I don't know how people do that." "I need a character," Hader tells Fresh Air's Terry Gross. "I need people out there with me." So Hader has stuck with sketch comedy — where he has been wildly successful. He joined the Saturday Night Live cast seven years ago along with Kristen Wiig and Andy Samberg, who both recently left the show. And he's garnered quite a bit of laughs and attention — including a recent Emmy nomination — for his role as Stefon, an obsessive New York clubgoer and nightlife critic. "The majority of people come up to me and say 'I'm a Stefon,' or 'I've been called a Stefon,' or 'I used to date someone like Stefon,' " Hader says. He cites one person who approached him to say he "liked that Stefon was gay, but it's not the joke that he's gay." Hader says that he and John Mulaney, a writer for Saturday Night Live who co-created the character of Stefon with Hader, appreciated that comment, because it meant the viewer got what they were going for. The joke is "more about how [Stefon's] doing a bad job and on a lot of drugs," Hader says. Hader says that as a child, he loved watching old movies with his family — and he was always interested in what was going on behind the scenes. So when he moved to Los Angeles to begin a career in entertainment, he intended to direct films. He found work as a production assistant on both low-budget and expensive Hollywood films for nearly four years before joining the sketch-comedy group Second City. Hader was eventually noticed by actress Megan Mullally (formerly of Will and Grace), who recommended him to Saturday Night Live producer Lorne Michaels. Hader was nominated for an Emmy as Outstanding Supporting Actor in a Comedy Series. The last Saturday Night Live cast member to be nominated in this category was Eddie Murphy in 1983. "I remember getting in the elevator for my audition and there was a guy next to me who had a backpack full of props and wigs and things, and I went, 'Oh my god, that guy is so prepared, I have nothing, I have no props.' And that was Andy Samberg. And Andy Samberg said he was looking at me going, 'Oh, that guy has no props. He doesn't need props.' And that was the first time we met, was in that elevator." "That moment is one of my favorite moments because it's a great film moment, but I just think of my mom ... getting choked up ... so that feeling, you just become a junkie for it. I just want that feeling over and over again." "And I went there, and that's when I realized there are people my age performing sketch comedy and performing improv theater, and I said, 'Oh, I need to be doing something creative. I've been here for almost five years and I've done nothing creative; I'm gonna do that." "What I'm seeing is are the camera guys are laughing, the cue cards are shaking because the cue card guys are laughing. Beyond that, I can see some of the writers, I can see Andy Samberg, people against the wall in 8H [the studio where SNL is filmed], they're all laughing, and then that kind of started it in John's mind." A previous Web version of the story, as does the audio, incorrectly identified actress Maureen O'Hara as Maureen O'Sullivan.